• Sa Id Grant, 18, of 759 W. Edwin St.; the county’s Narcotics Enforcement Unit; possesion with intent to deliver multiple bags of heroin and cocaine for his alleged involvement in drug sales on July 26, Aug. 16 and Aug. 28; the sales all allegedly occurred in the city; jailed in lieu of $75,000 bail. • Traneal Fairbanks, 34, of 312 E. First Ave., South Williamsport; South Williamsport police; strangulation and simple assault for allegedly choking Lindsey Gee and slamming her into a wall during a disturbance at the couple’s home on Aug. 26; initially jailed, but now free on $15,000 bail. • Kristin Bateman, 39, of 1510 Grimesville Road; Old Lycoming Township police; false reports to law enforcement and disorderly conduct for allegedly providing false information to police during an investigation into a crash involving her car in the 100 block of Grimesville Road on Aug. 14; sent a summons to appear before a district judge. • Karen Sampson, 58, of 653 Hepburn St.; Lycoming County detective; theft of lost property and receiving stolen property; she allegedly picked up off the floor one $10 bill and two $5 bills that another woman accidentally dropped as she went through security at the Lycoming County Courthouse, 48 W. Third St., on July 9; investigators allege that instead of returning the cash to the owner, Sampson picked up the money and used it to pay a fine at a district judge’s office; released on $5,000 bail; the victim was not identified in court records. • Grace Chestnut, 62, of 2411 Linn St.; city police; DUI and endangering the welfare a child in the 600 block of Hepburn Street on June 15; released on $5,000 bail; there was a 10-year-old child in the vehicle. • Carlos Pabon, 33, of 713 Clark St.; Pennsylvania College of Technology police; DUI in the 1100 block of West Third Street in the city on June 11; released on $3,500 bail. • Ryan Bennett, 21, of 812 Wyoming St.; city police; misdemeanor shoplifting for allegedly stealing $231 worth of merchandise from Rite Aid, 14 Fifth St., while employed there between June 9 and June 18; released on $5,000 bail. • Allen Ruschak, 21, of Bloomsburg; city police; possession of four bags of heroin and drug paraphernalia at High Street and Wildwood Boulevard on June 8; released on $2,500 bail. 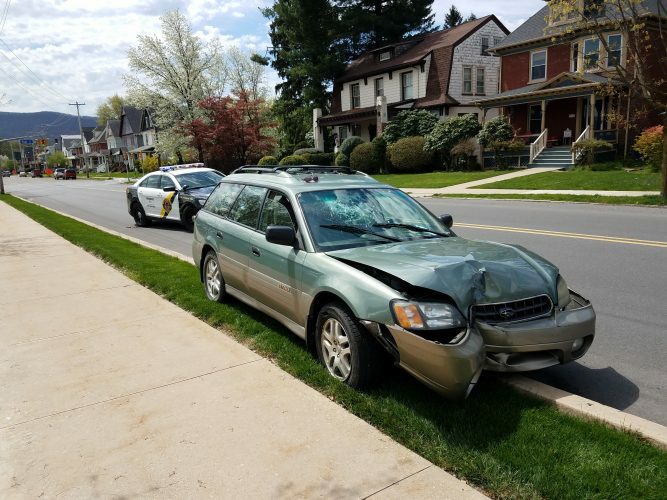 • John Beirlair, 19, of 720 Chestnut St., Montoursville; Montoursville police; DUI and underage drinking in the 100 block of Broad Street on June 4; released on $5,000 bail. • Phillip Haney, 27, of 724 Seventh Ave.; city police; DUI in the 100 block of West Third Street on May 31; released on $5,000 bail. • Travis Lander, 20, of 235 Broad, Montoursville; Montoursville police; DUI, endangering the welfare of children and underage drinking in the 300 block of Crawford Alley on May 25; released on $10,000 bail; he had a 16-year-old minor in the vehicle with him at the time. • Steven Bower, 25, of 5619 Route 44 South, Jersey Shore; state police; DUI following a crash in the 200 block of Back Street in Upper Fairfield Township on May 7; released on $5,000 bail. • Paul Hartman, 53, of Lebanon; city police; DUI at Via Bella and Basin Street on April 13; released on $5,000 bail; this was his second DUI arrest. • Brad Wright Jr., 21, of 179 Old Cement Road, Montoursville; state police; misdemeanor shoplifting for allegedly stealing a total of $1,119 worth of merchandise from Kmart, 1915 E. Third St.. on Feb. 6 and Feb. 13; released on $15,000 bail. • Anthony Rodriguez, 51, of 400 Lycoming St.; city police; felony and shoplifting for allegedly stealing merchandise from the Fine Wine and Good Spirits Store, 449 Hepburn St., back on June 22, 2017; released on $$7,500 bail. • Jan Winther, 28, of 4663 Pleasant Valley Road, Cogan Station; city police; DUI, careless driving and accidents involving damage to unattended property (hit-run) following a crash in the 800 block of Hepburn Street on April 4, 2017; released on $5,000 bail. • Jeffrey Wiestling, 37, currently serving a sentence at the state Correctional Institution at Huntingdon; state police; robbery, terroristic threats and related offenses for allegedly robbing two clerks at knifepoint of $400 at the Nittany Minit Mart, 1450 E. Third St., back on March 3, 2017; he is formerly of Williamsport and Scranton.